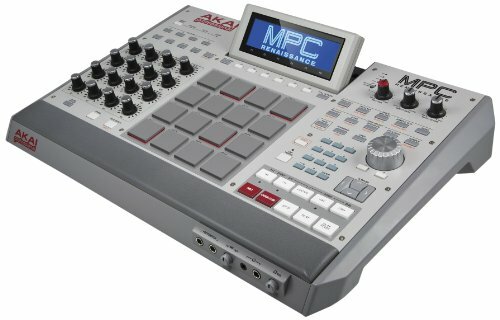 The influence of the Akai MPC on the development of electronic and hip hop music can’t be overstated. The ability to create percussion from any kind of sound turned sampling into what Vox magazine called ‘a new art form’. 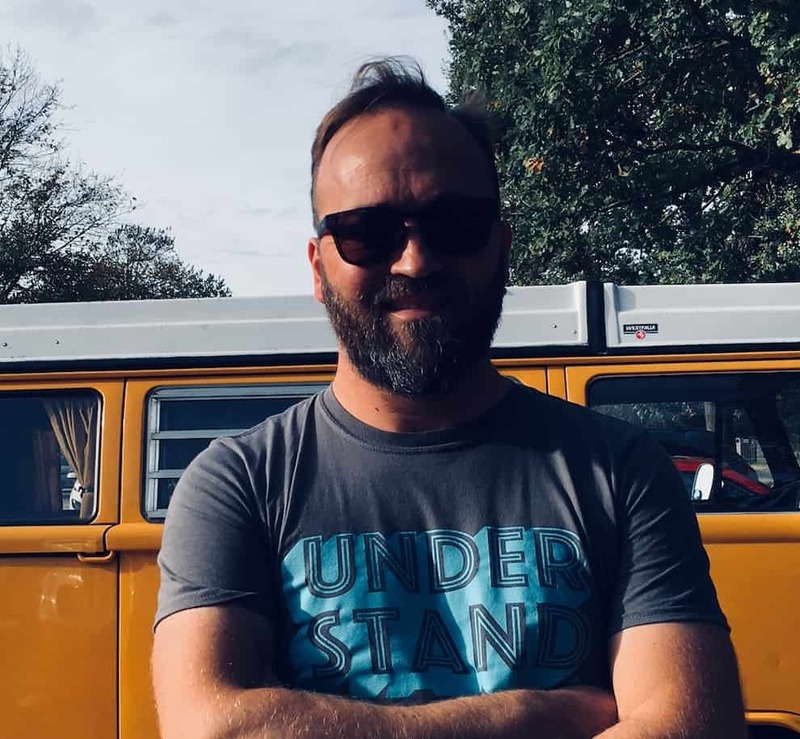 In this article, we’re going to look at what all the fuss is about. Starting with a short history, we’ll dive into crucial considerations you need to make when buying one and we’ll also recommend our favorite models on the market today. By the late 1980s, the best drum machines had enjoyed a decade or two of unbridled success as the go-to option for beat making. Meanwhile, around the same time, hip hop artists were using samples of recording – especially jazz and rare groove samples – to create new compositions. The MPC, created by drum machine expert Roger Linn while employed by Akai in Japan, managed to bring the two elements together: a standalone drum machine that was capable of creating samples. Up until this point, Grooveboxes such as those by E-mu Systems required knowledge of music production and cost a pretty dollar (up to $10,000 in some cases) – in short, a price way out of reach for most amateur music producers. 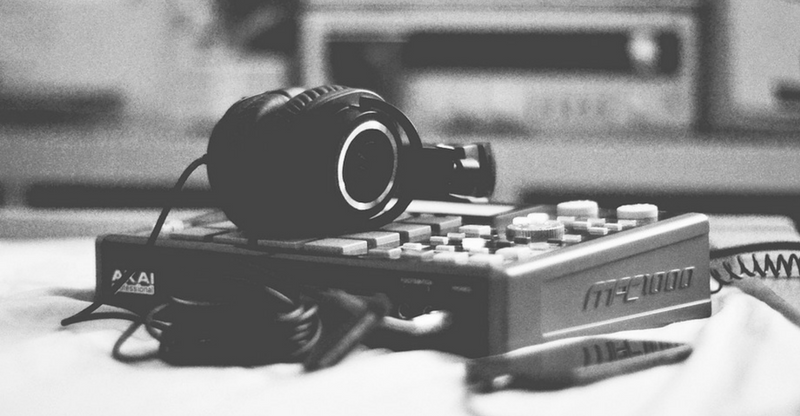 The MPC was revolutionary in the sense that it made this affordable for the first time. So, what are the key things to consider when buying one of these devices? First up, do you need it for gigging, home/studio use, or both? If you’re going to be playing live, consider getting a standalone unit which frees you up from needing a computer. If you are only using it at home or in the studio, you might be more inclined to use the MPC in combination with your Mac or PC. Most standalone units have the option of being used in combination with a Mac or PC, too, giving you the option for when you are in the studio. Do you need an in-built screen? Nearly all MPCs have one, but the more recent versions have high-resolution, touch-screen displays that are similar to those of a smartphone. These can feel great in the hands of an innovative user and they make it easy and intuitive to edit samples with your fingertips. Some models still rock a more old skool display, which you might prefer if you enjoy the tactility of buttons and/or are less keen on touchscreen technology. Many standalone MPCs can be powered off rechargeable batteries. This is an obvious plus for portability and can be really useful in live performances or while traveling. If you’re using an MPC in combination with a laptop or desktop, BUS power is also often a feature in these devices. This allows them to be powered off USB, with no need for an additional AC or DC adaptor. Many of the more powerful MPCs do require an AC or DC adaptor. This is fine if you’re using the device as part of a permanent home or studio setup, but might be less ideal if you’re traveling around with the machine. 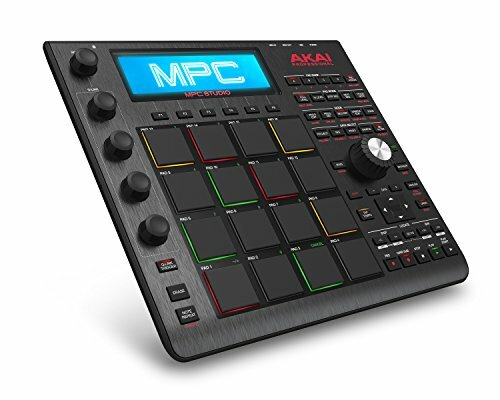 Part of the newest generation of these machines, the Akai Professional MPC is designed to be a completely self-contained unit for music production and performance. It contains massive amounts of internal storage, can be battery powered and is fully standalone, meaning you don’t need to use it in conjunction with a computer. There are no limits with this piece of kit. The inputs and outputs include MIDI, phono, jacks and USB – plus there’s also an SD slot, should you want to go beyond that device’s storage capacity. The screen is around the same size as a smartphone, making it easy to navigate with your fingers and the device can also be used with a Mac or PC if that’s what you prefer. There are 10 gigabytes of included sounds and samples here, giving you more than enough to get started with and all of these are easy to access, edit and manipulate using your fingers. This device is an excellent choice for those looking to use an MPC for live performance, and the portability it offers thanks to its battery life and lack of dependency is excellent for the traveling performer. It might be less suited to those who are looking for something more basic, and/or those who are on a budget. 7-inch color touch screen makes it easy to navigate through and control sounds. Rechargeable battery with up to 5 hours life makes it very portable. Plenty of input and outputs of different types make it extremely versatile. The display is flat, making it awkward to use properly without having the whole unit propped up the back – and there are no built-in stands. Not a beginner’s device, due to the high-end price tag. This is unfortunate as it is a great tool for learning to produce and DJ. Like the MPC Live, the Touch has a 7-inch screen, making it easy to control with your fingers. Although not a standalone station like above, the price is much lower, and much of the same functionality is included. Like the Touch, this device has MIDI and jack ins and outs, as well as a USB input. There are no phono holes, though, or SD slots. There are various banks, where you can save your projects. These are easy to select and navigate through via clearly labeled buttons. It has velocity-sensitive, light up pads making it easy to create melodies or trigger samples and there are easy-to-navigate play, record, overdub and stop buttons, amongst others. It requires power via the DC adaptor to be fully functional, though can be partially bus powered, minus the touchscreen. 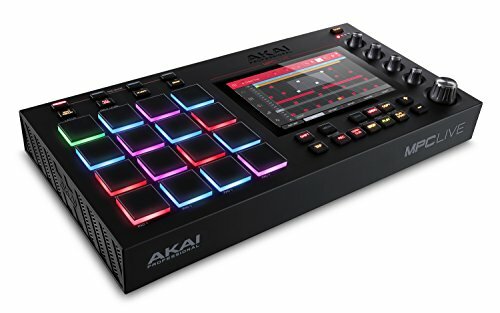 The Akai Touch will suit musicians who like the Live model but are on a budget and are happy to use a device in combination with a PC or Mac in order for it to fully function. It will be less suited to those who are looking for something more portable, although it’s not too bulky or inconvenient. Thick, responsive pads allow you to creatively produce beats and melodies or trigger samples. Selectable banks give it a streamlined layout. Poor driver support can cause problems using the touch screen. Fans of the Renaissance might not like the reduced number of dedicated controls in favor of a touch screen. Like the Live, the screen is flat, making it harder to use than a flip-up display. This is an earlier iteration of the portable friendly models. It doesn’t feature a touch screen but favors buttons and wheels instead. There are MIDI and USB ins and outs, making it perfect for creating MIDI music on your computer, alas, there are no audio ins and outs, limiting your options. There’s a huge sound library with this device, giving you more than enough to get started with and the clearly labeled buttons make it easy to navigate through and trigger selections of samples. At 2lbs this machine is pretty lightweight, meaning that you can easily take it wherever you take your laptop and it’s also pretty slim at 1.5”. It’s well built enough to be easily capable of surviving the gigging lifestyle and it can be bus powered, saving you the hassle of finding an extra plug socket. The MPC Studio will suit the old-school musician who likes to navigate through sounds and edit their samples using knobs and wheels, as well as sequencing software. It will be less suited to the more modern musician/producer, who craves innovation in their equipment and technology. A staggering amount of drum kits, synth sounds and more to experiment with gives this drum machine life of its own. A decent sized screen is built in so you can use this live without also needing to hook it up to a laptop or tablet for a display, which serves to enhance its live gig usability. However, the functionality of this is much more limited than the touch-enabled screens, and you will need to use your computer much more. It’s a very slim piece of kit, making it perfect for traveling. The interface is quite cluttered. Only an inch or so thick, it can be damaged quite easily if you aren’t careful. The pads are much thinner compared to the Touch/Live and aren’t as responsive to velocity, even after the sensitivity parameters have been adjusted. The Renaissance is designed to be used with specific MPC software, which limits it’s use somewhat. There are 16 knobs which can be set to control just about anything and 16 pads which can also be assigned to trigger whatever you like. The pads have excellent sensitivity to velocity and there are four banks, for you to save multiple projects or settings to. The Renaissance has an impressive amount of inputs and outputs: from MIDI to jack to XLR, meaning you’re unlimited in terms of what you can sample and there are two USBs to enable fast audio integration. It’s very pricey, and is difficult to use as a standalone device but combined with the included software, this machine has no limits and it also comes with a massive 9GB of sounds, to more than get you started. The Renaissance is perfect for the serious sampler who intends to spend a lot of time in the studio, with the device to capture and manipulate a series of different sounds. It will be less suited to those who want a simple set of pads to create beats on. High-quality pads with great velocity sensitivity. 16 Encoders that can be set to control just about anything. Older style monochrome display, however, it does have most of the information needed for you to rely entirely on the screen without using a computer monitor (but this is much less so than the newest screen designs). Quite heavy, so isn’t as useful for gigging. The flagship of the series – this one is loaded with the newest developments in music production technology and is hands down the most advanced one you can find. 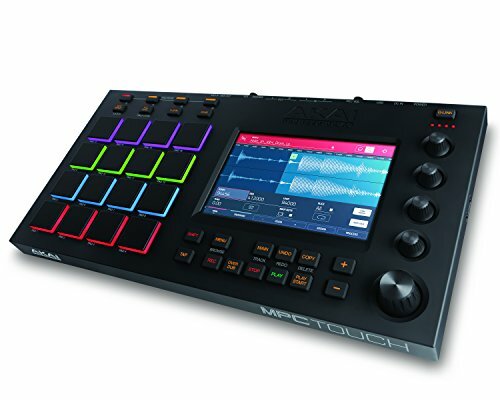 There’s a flip-up, 10” touch screen to make it easier than ever to manipulate sounds and there are 16 pads, 16 knobs as well as multiple more buttons and wheels. There’s also 16 gig of internal storage! There are multiple MIDI, USB, and audio ins and outs, making your options limitless in terms of what you can sample and release and the device can easily work as a standalone machine as well as having the option of working with a Mac or PC. Of course, the machine’s very pricey, but the quality is exceptional and the functionality is without fault. The ‘X’ will suit the professional musician/producer who requires the ultimate in storage, functionality and quality. It works as a standalone device, so there’s no PC needed which makes it an excellent choice for the pro on the go. It will be inappropriate to those just starting out with sampling machines, or to those on a budget. Flip up display, and 10” screen makes the touch screen much more functional. Completely standalone – no need for a computer. 16 dedicated Q-links that can be loaded with custom settings. One of the most expensive currently available, this is a serious piece of equipment that will need an equally serious investment. Weighs 12 lbs so can be a little heavy for traveling with to gigs. The flip-up screen is quite delicate. Which Akai MPC you buy depends entirely on your needs and preferences. It the goal is to have something you can use at gigs, and you don’t mind bringing along a laptop or notebook, the MPC Studio or MPC touch are great choices. Both of these work with software to trigger and edit samples, and they’re portable enough to carry with your laptop. The studio has no touch screen, making it better suited to the oldskool musicians out there, whilst the touch has – as the name suggests – a smartphone-style touch screen. Oldskool fans also have the option of the Renaissance. It looks and acts like a classic machine, whilst still having many of the benefits of new technology including two USB inputs and velocity-sensitive pads. It does need to be used in combination with specific software, though, which makes it a little more limited than some of the other devices. If full music production, as well as live performance, is what you’re looking for, the MPC X is easily the most advanced standalone unit you can get. It works as a standalone device and has exceptional functionality, storage as well as all of the inputs and outputs you could with for. 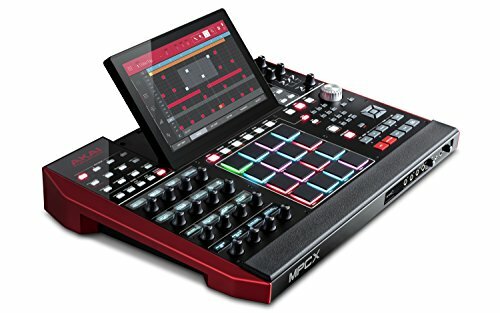 It is, however, very expensive, so the budget option would be the MPC Live. It’s a more basic version of the ‘X’ and is much more affordable. Like the ‘X’, it works as a standalone unit. Whichever Akai MPC suits your requirements the best, we hope that our reviews have helped you to find out. Enjoy!